An unusual early case map of London. The London Directory or a New & Improved Plan of London, Westminster & Southwark; with the adjacent Country, the New Buildings, the New Roads and the late alterations by Opening of New Streets, & Widening of others 1790. A highly appealing 1790 map of London by Robert Sayer. Centered on the Thames River, this map details central London from Islington to Shadwell and from Newington Butts to Tyburn. Only three bridges cross the Thames: Westminster Bridge, London Bridge, and Blackfriars (B.L. Fryers). The portions of the city devastated by the 1666 Great Fire of London are highlighted in red. A street index and public building index appears below the map proper. The earliest edition of this map was published by Sayer in 1765, with numerous updates to about 1800 – all states are rare, this being the 13th. Another, almost identical version of this map was issued by John Carrington and, having a slightly longer lifespan, was published and updated until about 1811. Very good condition. Original linen backing in frayed, split, and reinforced in places, but the printed map itself is in near fine condition. Comes with orignal marbled paper case. 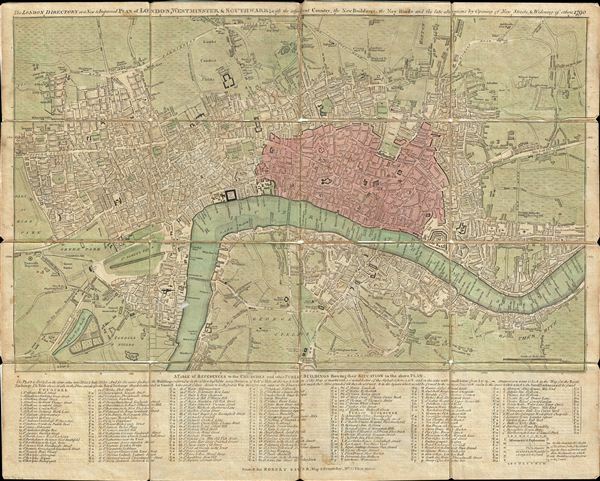 Howgego, James L., Printed Maps of London circa 1553-1850, #138-13.